We got hundreds of photos from readers in 2017. Here’s the best. 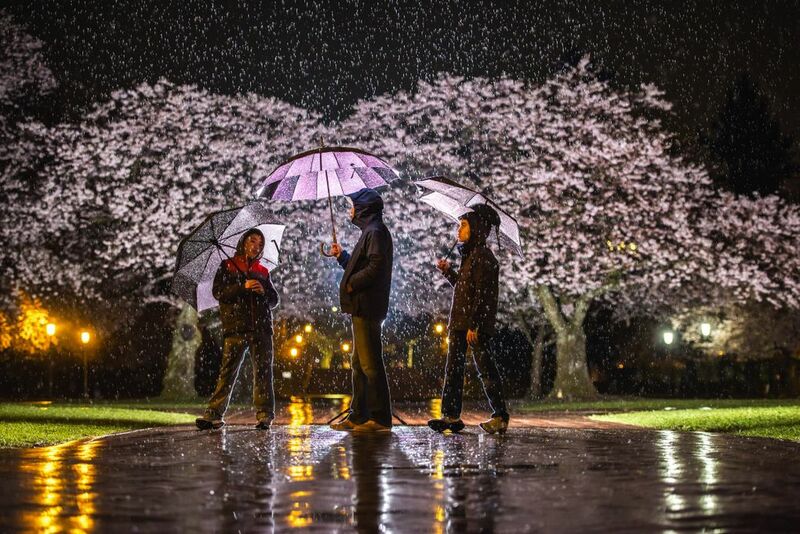 GRAND-PRIZE WINNER: Seattle Times reader Yoshiki Nakamura shot this photo last April of nighttime visitors to the University of Washington Quad at cherry-blossom time. He captured the image with an 82mm lens at ISO 1000, 1/25 second at f/2.8. The top 10 reader photos we received this year include a unique view of University of Washington cherry blossoms in the rain; the gentle love of a goose for its gosling and the visual poetry of autumn leaves swirling in a stream. In many arenas, 2017 has shown there are always new ways of looking at things. Cameras prove that all the time, whether they’re pricey SLRs or run-of-the-mill smartphones. Among top images from our readers in 2017 were this unique view of University of Washington cherry blossoms in the rain, or photos showing the gentle love of a goose for its gosling, or the visual poetry of autumn leaves swirling in a stream. Over the past year, Seattle Times readers submitted hundreds of such images to our Reader’s Lens feature. This photo is so rich. I love the depth that is a result of very effective lighting. Setting up three off-camera strobes in the dark and in the rain and getting the perfect angle on all the elements was no small feat. I admire this photographer for his tenacity, thoughtfulness and creativity. Everything in this image really “pops,” with so many parts for the eye to take in. The backlit subjects, illuminated trees, shiny raindrops and reflections on the pathway create so many layers. The low angle gives the photo impact it wouldn’t have otherwise by highlighting the raindrops and umbrellas. A successful photographer must have an aptitude for detail and the ability to see how all aspects of the image fit together in an aesthetically pleasing way. Well done, Mr. Nakamura! At year’s end, we’ve chosen 10 favorites to be our Seattle Times Reader Photos of the Year — a grand-prize winner and nine honorable mentions. A $25 Starbucks gift card goes to Honorable Mention winners in three categories: Northwest Flora and Fauna (see the winning photos here), Northwest Fun and Adventure (see the winning photos here), and Northwest Scenics (see the winning photos here). Judging was by Angela Gottschalk, Seattle Times photo editor; Times photo specialist Colin Diltz, and Brian J. Cantwell, Seattle Times travel & outdoors editor. Photo specialist Katie G. Cotterill assisted in selection. Thanks to all who sent in so many images of Northwest life and living. Please keep sharing your recent photos from the region at seattletimes.com/submit-photos.